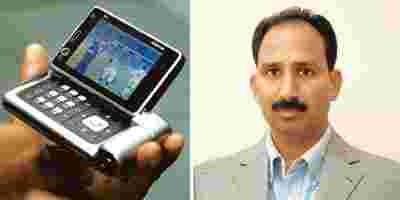 Hands on: Live streaming on cellphones (left - PTI) is one of the latest attractions for start-ups; Apalya’s CEO Vamshi Reddy. Bangalore: At a time when most start-ups are struggling to raise the first round of funding, Apalya Technologies Pvt. Ltd is an exception. The firm has raised funds twice over the last two years—an undisclosed amount from Mumbai Angels in 2008 and $3 million (Rs13.98 crore now) from IDG Ventures and Qualcomm Ventures last month. Apalya is a mobile video delivery platform that streams video content on mobile handsets, in long and short formats—live and on demand. Streaming content on handsets is the latest attraction for start-ups and investors, triggered mainly by the uptake of handsets and the likely launch of 3G, or third generation, high-speed telecom technology services by the end of the year. According to the Telecom Regulatory Authority of India (Trai), there were 471.73 million wireless subscribers by the end of September. “An alternative (to a single TV set in a home) is always welcome," says T.C. Meenakshisundaram, founder and managing director, IDG Ventures India, who is on Apalya’s board. “Instant snacking information is required. This would be the USP (unique selling proposition) of such services." Start-up MobileJockey.tv is offering animated jokes on handsets. Entertainment is the most watched category on cellphones in India, says its CEO Venkat (he goes by one name). The firm is now looking for venture capital (VC) funding. Meanwhile, Motvik Technologies Pvt. Ltd is conducting trials for an application called ShowLiv, which allows live coverage of events via handsets. “We intend to launch the service in six months. We are speaking to operators and are meeting media companies, urging them to get their reporters (to) use this," says its co-founder, M. Thiyagarajan. Mobisy Technologies Pvt. Ltd has started a news aggregator service called NewsTop, which collects news from various sources and delivers it on the handset. “The response has been good. TOI (The Times of India) and The Indian Express has maximum traction," says its chief Lalit Bhise. Hyderabad-based Apalya has started live streaming on the 3G mobile services of state-run telecom operators Bharat Sanchar Nigam Ltd and Mahanagar Telephone Nigam Ltd. It also powers Mobile ESPN (of sports channel ESPN Star Sports) through which subscribers can access all the programmes on the TV channel. “With the Indian market opening up to 3G, we plan to introduce additional mobile entertainment services, including customized entertainment channels, premium video programming and mobile-exclusive original programming," says its co-founder and chief executive Vamshi Reddy. The 2010 Commonwealth Games is also likely to act as a trigger for these services. “I believe Commonwealth Games and 3G roll-out will bring new technologies enabling usage of handsets for various coverages," says Sudhir Sethi, chairman, IDG Ventures India. To be sure, revenue sharing with telecom operators has always been an issue with firms offering value-added services (VAS), and the problem continues with these firms. “We are not really happy with the revenue sharing. We are no different from what VAS firms feel," says Reddy. Experts caution that globally, not much success has been seen in streaming rich media content. It needs to be snacking content of 3-4 minutes and works well only for that, says Harish Gandhi, executive director, Canaan Partners. “My concern is that if available bandwidth would be enough for this streaming of content," he says. “Also, how much degradation of quality will it have when there are many people using it in the same area?" Given that the services would be expensive, how many would adopt it is a concern, says Diptarup Chakraborti, principal research analyst, Gartner India. “(3G) auction prices would be high. Therefore, the service would not come at cheap prices," he says.